The complete bamboo collection, you will get one each of the Black, Yellow and Green bamboo in a 2L pot. Includes Phyllostachys nigra - rich, coffee-black canes with bright green foliage. Includes Phyllostachys auerosulcata 'Spectabilis' - golden-yellow canes with splendid green leaves. Includes Phyllostachys biessetii - easy to grow with classic green foliage and stems. Ideal for use as screening and hedging, each plant is supplied in a 2L pot ready to plant out. Buy the collection and save £20. You will get one each of the Black, Yellow and Green bamboo in a 2L pot. This gorgeous bamboo’s canes turn a rich, coffee-black as they grow, contrasting wonderfully with the bright green foliage. Perfect as an instant-impact feature, or an eye-catching screen! Slow growing and noninvasive too. Height 2m (6ft). 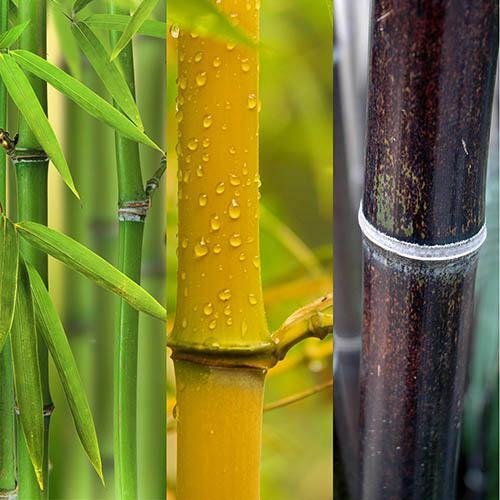 Long, slender, golden-yellow stems that form delightful zigzag patterns as they grow; together with splendid green leaves – a gorgeous bamboo for any garden! Ideal for screening a shed or dividing areas in your garden. Height 2m (6ft). Supplied as established plants in 2L pots, one each of Yellow, Green and Black.